Because Ryan and I planned to be gone over Christmas (and are STILL gone as you read this), we tried to avoid grocery shopping and instead wanted to use up the food we had already. This proved to be a little challenging the last few days, when we were essentially out of fruit, vegetables, eggs, etc. I wanted to make a "special" breakfast our last morning at home, and discovered that we had mostly everything for these gingerbread pancakes! I modified the recipe a bit, based on what we had on hand, and these turned out delicious. Ryan topped his with candied pecans, maple syrup, and whipped cream...while I opted to top mine with Stoneyfield Oikos Greek Yogurt (and later whipped cream--YUM). FYI--I'll be posting a review of the Stoneyfield Greek Yogurt in the next few days. These are a perfect holiday breakfast...and now that the holidays are passed, feel free to make them in memory of a great Christmas :) We will definitely be making these again soon--they rivaled some of our favorite pancakes ever!! 1. Mix the flour, baking powder, ginger, cinnamon, and cloves in a large bowl. 2. Mix the milk, egg, butter, sugar, and molasses in another bowl. 3. Mix the wet and dry ingredients. Do not overmix. Add a bit of water, if you prefer thinner pancakes. 4. Heat a skillet and pour batter onto the skillet. Flip pancakes when golden brown. As soon as I saw this recipe on Kate's blog, I knew I'd be making it. We had some frozen bay scallops in our freezer (we used them to make this last time) and I wanted a new recipe to try them in. I was actually a little bit wary of the recipe as I was making it, unsure of whether or not we'd like it. However, both Ryan and I loved this dish and would definitely make it again. The fresh flavors from the parsley and lemon really stood out and it was a cinch to throw together after work. 1. Heat 3 tbsp olive oil in a skillet over medium-high heat and add potatoes.Saute until golden brown, about 10-15 minutes. Remove from skillet and set aside. 2. Add remaining oil to skillet and heat over medium-high heat. Add scallops and cook, stirring constantly, until they are lightly seared, 2-3 minutes. 3. Add lemon zest and garlic and cook 1 minute more. Return potatoes to skillet with parsley and stir to blend. Add lemon juice and season with salt & pepper. 4. Serve immediately garnished with lemon wedges and parsley. Despite not having all of the required ingredients (thanks to me forgetting my list on the kitchen counter when I grocery shopped! ), this soup still turned out just fine. It was filling and oh so spicy! If you don't like a ton of heat, I recommend scaling back on some of the spices. Eating this with tortilla chips helped to balance the flavors, as would some sour cream or avocado. I must say, winter's only (seriously, ONLY) redeeming factor, is the abundance of soups! 1. In a medium saucepan, heat olive oil over medium high heat. Add onion, pepper, and garlic and cook for 2-3 minutes, or until fragrant. Season with chili powder, cayenne pepper, and cumin; cook for 3-5 minutes. 2. Add beans, tomatoes, and broth. Cook over low heat for 20-25 minutes, or until mixture begins to simmer, stirring frequently. About five minutes before removing from heat, add corn and stir to combine. 3. Place 2/3 of the soup in a blender and puree until soup reaches desired consistency. Combine pureed soup with the rest of the batch; served with crushed tortilla chips and shredded cheese. Asparagus is one of my favorite veggies and this is a simple side that's great with just about anything. This time we ate it along with our butternut squash, black bean, and feta pita sandwiches....basically a heavenly meal! 1. Wash and chop asparagus into one inch pieces. Slice mushrooms. 2. Add both vegetables to a baking dish. Lightly coat with olive oil, mixing to ensure that everything is evenly coated. 3. Sprinkle with salt, pepper, and garlic powder. 4. Roast at 400F for approximately 30 minutes, to desired tenderness. No posts today or tomorrow because I doubt anyone will be reading. Instead, I hope you're enjoying celebrating Jesus' birth with your families! Back on the 26th with an AWESOME dinner recipe, don't miss it! These were another one of the desserts I made for work last week, but I probably wouldn't recommend you make these, at least not without some alterations. While they were good, they weren't great, and I have plenty of desserts I'd rather eat! I actually made these because I was looking for a way to use up a few symphony candy bars that I had in my freezer (from a Walgreens candy sale, go figure). I searched for recipes that used milk chocolate bars and found this one. Like I said, it was pretty good, but it lacked something. The crust beneath the milk chocolate was a little bland for my liking. I'm posting the recipe for full disclosure (I feel like I'm always raving about recipes, ha), and in case they strike anyone's fancy. However, if you want a REALLY GOOD recipe, go make these ginger cookies! I've made them 3 times now and people go crazy for them every time! 1. Blend the butter and sugar. 2. Add egg, vanilla, flour, and salt. Mix well. 3. Spread batter in a greased pan (9 x 13). Bake at 350F for 20 minutes. 5. Sprinkle top with nuts. 6. Allow to cool and cut into squares. My mom's sugar cookies are my favorite kind of sugar cookies, but as soon as I saw this recipe on Steph's blog, I knew I had to try these. Not only are they super cute, but they gave me an excuse to use both my pastry bag for frosting AND some of the festive Christmas sprinkles my mom sent me in my St. Nick's package :) These take a little bit of time to fill the muffin tin, but they're still simpler to make than rolling out the dough and later frosting each cookie, as I usually do with sugar cookies. There are so many fun decorating options with these--I can't wait to make them again! 2. Cream butter and sugar until light and fluffy. Add egg and vanilla and mix well. 3. Mix dry ingredients in a separate bowl. Add a little at a time to the butter mixture, mixing until the dough comes together. 4. Grease a mini muffin tin. Fill each hole with dough to the top of the tin, smoothing out with the back of a spoon. 5. Bake for 8-10 minutes, until a toothpick comes out clean. 6. Cool in the pan for a few minutes. Remove cookies from the muffin tin carefully and allow to cool completely on a wire cooling rack. 1. In a large bowl, combine sugar, butter, water, and vanilla. 2. Beat on low speed to combine, then beat on medium speed for a full 5 minutes, until it looks like frosting. 3. Pipe onto cooled, cooked sugar cookies & decorate with sprinkles! This wins for easiest Christmas treat! I was looking for something simple to add to the treat goody bags I made for my co-workers and this turned out to be perfect. It literally took 15 minutes to put together but was a perfect complement to the mint m&m cookies, chocolate covered pretzels, candy cane cookies, ginger cookies, and praline mix. Note--picture updated in December 2011. Remaking this I was reminded just how easy this is and how much people love it! This time around I used dark chocolate for the base which I preferred...but my brother Quinn said he likes it best with milk or semi-sweet chocolate...to each his own! 1. Melt chocolate chips in a microwave, stirring every 30 seconds until chocolate is smooth. 2. Allow chocolate to cool slightly. 3. 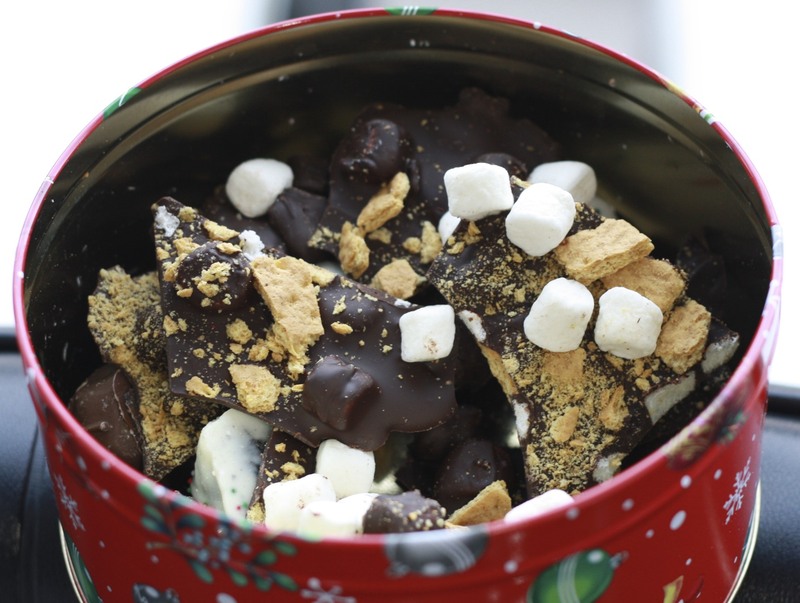 Stir in 1/2 cup graham crackers and 1/2 cup marshmallows, stirring to completely coat in chocolate. 4. Pour chocolate mixture onto a foil-lined cookie sheet, spreading evenly with a spatula. 5. Press remaining graham crackers and marshmallows into the chocolate. 6. Place cookie sheet in refrigerator or freezer, until hardened. 7. Peel bark off of the foil and break into pieces. **can be made ahead of time and stored in the fridge or freezer! I think these are my new favorite cookie. A friend from church made these to share with a group of us when we went caroling and before I knew it, one bite of Ryan's turned into three giant cookies. I love the flavor almond extract has, and I think that, coupled with the large amounts of butter in these make for very addictive cookies! 1. Mix the above ingredients with a stand or handheld mixer, except the red food coloring, until dough forms. Set dough aside. 2. Repeat step 1, adding red food coloring while mixing, until you have a pink dough. 3. Scoop an equal portion of dough from the plain and pink doughs. Roll each dough ball, separately, into logs until they are equal in height and length. 4. Press the two logs together and twist, forming into the shape of a candy cane. 5. Lay candy cane cookies on an ungreased cookie sheet. Bake for 9-11 minutes at 375F. I have a slight addiction. It's an addiction to the candy aisle at Walgreens. It doesn't matter how much of a rush I'm in or how many other things I need to buy, I always take at least a little bit of time to peruse the candy aisle. I don't quite understand this need, it's just a little quirk of mine that usually doesn't get me in any trouble...most of the time I leave the aisle empty-handed and continue on my merry way. However, there are days when I fall prey to the brightly colored packages and find myself walking away with one or two of my favorite candies. When I was there last weekend, I skipped past the dots and swedish fish (my favorites) and instead picked up two bags of mint m&ms. I actually don't even really like mint m&ms, so I bought these with Ryan in mind. However, after filling one of my Christmas candy jars with the m&ms, I decided to use the other bag in some cookies. These were another one of the sweet treats Ryan and I brought into work last week. These were perfect--soft and chocolately with a hint of mint from the m&ms. I searched for a general m&m cookie recipe on allrecipes.com and made a few changes, using butter instead of shortening and adding cocoa to the batter. Next time you're in Walgreens, pick up some of mint m&ms and make these cookies, you won't regret it! 1. In a large bowl, mix sugar, eggs, butter, and vanilla. 2. Add flour, cocoa, salt, and baking soda to creamed mixture. Blend well. 3. Stir in m&ms until well combined. 4. Drop dough by teaspoonful onto cookie sheets. 5. Bake at 350F for 9-11 minutes. 6. Cool cookies on a wire cooking rack and store in an airtight container. Ryan and I have a bad habit of stocking our freezer with things and then forgetting about them. If you want evidence, just look at the two dozen bags of baking chips in my freezer! (I wish I were kidding!) We've had strip steaks in our freezer that my in-laws gave us last Christmas...we figured we'd better make them before Christmas '09 struck! Since we had an open bottle of red wine, we decided to make some sort of a red wine sauce. A google search led me to this recipe from foodnetwork.com, which I slightly altered by adding mushrooms and adjusting the quantities for two steaks. We also opted to grill the steaks outside, rather than cook them on the stovetop. The combination recipe, with the original quantities and the addition of mushrooms is posted below. We loved this sauce. Anything with rosemary is good in my book and this flavorful sauce was no different. Ryan cooked the steaks perfectly, first marinating them in Daddy Henckel's marinade and grilling them (yes, outside, in December, in a rain storm no less!). These steaks paired perfectly with sauteed spinach and baked sweet potato discs. 2. Heat oil in a large skillet over medium heat. Add onion and mushrooms to skillet. Cook until browned, stirring, for about 2 minutes. 3. Add half the rosemary and half the garlic and cook, stirring, 20 seconds. 4. Add wine. Increase heat to high and boil vigorously for 2 minutes. 5. Add broth and sugar. Boil 10 minutes, or until liquid is reduced by half (about 1 cup). 6. Add in remaining rosemary and garlic. Pour over steaks and serve. Perfect for a holiday dinner! So delish! I had an abundance of work events to bake for this past week. I think between Ryan and I, we had four different things we needed to bring treats to! I decided to just bake a bunch of different things and we could take in a combination of whatever sweets we wanted for each of the various lunches or meetings. I'll be posting these over the next several days. The first of these was chocolate covered pretzels, one of my all-time favorite holiday treats. I know you can eat chocolate covered pretzels at any time of year, but I always associate them with Christmas because they're one of my mom's holiday staples. She usually covers the pretzels rods, but I went with the mini pretzel twists instead. These turned out outstanding, and I owe all of the credit to Ghirardelli! While chocolate covered pretzels are always good, these were over the top because I used such a high-quality chocolate. I loved the rich chocolate flavor of these and while it's a little tedious to stand and dip each pretzel, it's well worth the extra time and effort! **Note--I also did white chocolate covered pretzels, using 2 Ghirardelli White Chocolate baking bars, melted in the microwave with 1/2 tbsp shortening. 1. In a large glass bowl, microwave the chocolate chips & shortening, stirring every 30 seconds until chocolate is melted and smooth. 2. Individually dip pretzels into the chocolate mixture, fully coating with chocolate and removing with a fork. 3. Place dipped pretzels on a cookie sheet lined with wax paper. 4. Shake sprinkles onto pretzels. 5. Place filled cookie sheets in freezer until chocolate is hardened. Remove pretzels from wax paper and store in an air tight container in the fridge. Thanks Ghirardelli for sending me the delicious chocolate chips to make these!! I felt like it had been weeks since I'd made Ryan a "snack" to enjoy in his lunches. Yes, I've been cooking and baking quite a bit, but things have been hectic and I haven't been making Ryan-specific treats as often as I usually do (he's spoiled, huh? :)) I was anxious to make something and these fit the bill for a number of reasons--namely that they didn't require the use of an oven and they utilized honey, which Ryan's been a big fan of lately. These were so good, and didn't last long in our house! In fact, I think I ate just as many of these (or more) as Ryan. I had to make a second batch a few days later! They had a yummy peanut butter/honey flavor and the coconut and raisins were good additions. I can't wait to experiment with variations of this recipe! 1. In a large bowl, combine rice krispies, oats, raisins, and coconut. 2. Heat brown sugar and honey over stovetop until slightly boiling. Remove from heat and stir in peanut butter and vanilla, until melted. 3. Pour warm mixture over the dry ingredients and mix until well coated. 4. Press mixture into a greased 9 x 9 pan, pressing firmly with wet hand. 5. Chill bars in refrigerator until firm. Slice and enjoy! **Remember last time I made granola bars? Those were good too! As mentioned, I brought two different kinds of enchiladas over to our friends' house in exchange for holding their baby! These chicken enchiladas were easy to throw together--I like making enchiladas because you can kind of throw whatever mexican ingredients you have on hand into them and you don't necessarily have to follow a recipe. The variation we went with this time is listed in the recipe below....Ryan actually took charge of these, but I'm on posting duty! 1. Heat chicken, corn, and diced tomatoes in a skillet over medium heat until warm, about 10 minutes. 2. Season mixture with garlic powder, cumin, and chili powder. 3. Spoon filling into each of the tortillas, adding desired amount of cheese, and rolling tortilla tightly. 4. Spread a thin layer of enchilada sauce in the bottom of a 9 x 13 pan. Place rolled & filled tortillas inside the pan. 5. Top dish with more cheese and the remainder of the enchilada sauce. Cover with foil and bake at 350F for 20 minutes, until cheese on top is melted. I love babies and I haven't had the chance to hold one in WAY too long (nor am I ready for my own!! ), so when my brother-in-law's good friends had a baby, I jumped at the chance to bring them dinner, clearly with an ulterior motive :) I made two different kinds of enchiladas--chicken (recipe to be posted tomorrow), for the traditional-folk, and these black bean and sweet potato enchiladas, for the adventurous. I'd never made these before, but I love anything with sweet potatoes and when I googled "sweet potato enchiladas", I found a yummy-sounding recipe and went with it. These are a different spin on the typical cheese-oozing enchiladas, but they are so good! I already can't wait to eat them again. 1. Preheat oven to 400F. Put the sweet potatoes on a lightly oiled baking sheet in a single layer and roast for 20 minutes, turning once, until they're tender. Remove from oven and set aside. 2. Turn oven down to 350F. Heat the oil in a large skillet over medium heat. Add garlic and cook about 30 seconds, stirring constantly, until fragrant. Add beans, tomatoes, chili powder, and salt & pepper to taste. Add cooked sweet potatoes and simmer mixture 5 minutes. Set aside. 3. Spread a thin layer of salsa on the bottom of a lightly oiled 9 x 13 baking dish. 4. Place a tortilla on a flat surface, spoon a portion of the sweet potato mixture down the center of it and roll it up. Repeat with remaining tortillas. Line the rolled tortillas up next to each other in the baking dish, seam side down. Top with remaining salsa and red onion. 5. Cover and bake for approximately 20 minutes, until casserole is hot and bubbly. Last year, a guy I worked with discovered I loved to bake. Immediately he sent me the recipe for these brownies, promising me that these were the best brownies I would ever taste. He literally emailed me the recipe daily, until I finally decided to appease him and make the brownies. I'll be honest, I wasn't expecting anything outstanding. I've had a lot of brownies in my day and while they're typically good, none knocked my socks off. None until these, that is. The key to these brownies, besides what I believe is a perfectly concocted recipe, is using high-quality chocolate, specifically Ghirardelli. My co-worker told me time and time again that these brownies would only be successful if I used Ghirardelli chocolate. I have yet to try another brand of chocolate because I'm convinced they won't be as good with anything else. Fast forward a year, to this month. Linda, a Ghirardelli rep, sent me an amazing sample package of products for me to review on the blog, including bittersweet chocolate baking bars, white chocolate baking bars, bittersweet chocolate chips, and semi-sweet chocolate chips. I cannot wait to try some of the recipes on Ghirardelli's recipe site, but as soon as I got the package, I knew these brownies would be my first baked good! Stay tuned in the next couple of weeks as I continue to bake with the chocolate Ghirardelli sent me and post about it on the blog. Until then, RUN to your nearest grocery store, pick up some Ghirardelli chocolate and make these! They're perfectly rich and gooey and chocolately. You'll definitely want to share these...your waistline will thank you! **Note that the recipe calls for unsweetened chocolate. I used bittersweet chocolate and less sugar to account for this change. However, the original recipe is below! 1. Adjust oven rack to middle position. Heat oven to 325 degrees. Line 9 x 13 dish with foil and spray with nonstick cooking spray. 2. Whisk to combine flour, salt, and baking powder in medium bowl. Set aside. 4. When chocolate mixer is smooth, gradually whisk in sugar. 5. Add eggs one at a time, whisking after each addition until thoroughly combined. Whisk in vanilla. 6. Add flour mixture in 3 additions, folding with rubber spatula until batter is completely smooth. 7. Transfer batter to prepared pan; using spatula, spread batter into corners of pan and smooth surface. 8. Bake for 30-35 minutes, until a toothpick inserted in the center comes out with a few moist crumbs attached. 9. Allow to cool in a wire rack. 10. Heat chocolate chips & whipping cream over low heat in a saucepan, stirring constantly until chocolate is melted and mixture is thickened. 11. Pour ganache over brownies and spread evenly (this can be done 10 minutes after brownies are removed the oven). Get ready to experience the BEST brownie of your life! Thanks Ghirardelli for the chance to make these! 1. Mix butter, dried mustard, and poppy seeds in a small bowl until soft, creamy, and well combined. 2. Slice rolls in half. Spread a layer of the butter mixture on half the roll. 3. Place ham and cheese on top of butter. Put the top half of the roll back on the sandwich. 4. Wrap sandwich in aluminum foil, making sure that the sandwich is not exposed on any side. 6. Remove sandwiches and allow to cool for 5-10 minutes. Unwrap from foil and dig in! No food post for you today--instead, head over to Booking Mama's site, where I've guest-posted about book clubs. Believe it or not, I do have other interests besides food, books being a major one! I love reading Booking Mama & her book reviews, because it helps me determine what books to add to my ever-growing list of "books to read". Come back tomorrow for another delicious warm sandwich recipe! 2. Slice ciabatta roll in half (horizontally) and pull some bread from the loaf to form a slightly hollow center. 3. Drizzle ciabatta bread with olive oil. Spread whole grain mustard on half the loaf. Sprinkle on half of the Fontina cheese. 4. Heat 2 tbsp oil in large skilled over medium-high heat. Add mushrooms and saute for 4 minutes. Add chopped shallots and pressed garlic; saute for 3 minutes. Add chicken, saute minutes to heat through. Transfer to plate. 5. Add 1 tbsp oil to skillet. Add spinach, saute 2 minutes. Season to taste with salt and pepper. Drain. 6. Spoon chicken mixture, then spinach over loaf. Top with remaining cheese. Put loaf back together. 7. Wrap sandwich tightly in foil. Bake sandwich until cheese melts, 20-30 minutes. Wow. Don't wait until next Fall to make these! These might be my new favorite pumpkin dessert (although I still love this and this and this and this). These pumpkin blondies are soft and gooey and bursting with flavor, thanks to the pumpkin, butterscotch chips, and white chocolate chips. It is a terrific blend of tastes and not a single person who tried one disagreed! 1. Preheat oven to 350 degrees. Line a 9 x 13 pan with foil. 2. In a medium bowl, combine the flour, pumpkin pie spice, baking soda, and salt. Stir together and set aside. 3. In the bowl of an electric mixer, beat together butter and sugar until light and fluffy. 4. Beat in the egg and vanilla until well combined. Mix in the pumpkin puree. 5. With the mixer on low speed, add the dry ingredients and mix until just combined. 6. Fold in the white chocolate and butterscotch chips. 7. Spread the batter evenly in the prepared pan. Bake until edges begin to pull away from teh sides of the pan and a toothpick inserted in the center comes out with just a few crumbs (35-40 minutes). 8. Transfer the pan to a wire rack and cool completely before cutting. Enough reading, GO MAKE THESE!! I originally was making this salad to bring to my monthly "girls dinner" with my 2 besties from work, Paige & Ashley. However, at last minute, we had to cancel :( However, I'd already prepared the salad the night before, so Ryan and I chowed down on it! This was definitely an interesting salad--I used spinach instead of the arugula it called for and I wonder if that would have varied the taste at all. I liked this, but I didn't love it. Don't hesitate to try it if these flavors appeal to you, I'd be anxious to hear other people's opinions! 1. Using a food processor (or by hand), coarsely chop cranberries. Transfer to bowl. 2. Peel oranges. Section oranges over bowl to catch juice. Add sections and juice to cranberries. 3. Stir in celery, onion, sugar, lemon juice, and ginger. 5. Toss arugula with mint and oil. Top with cranberry mixture. While Thanksgiving may have come and gone, I'm not ready to let go of pumpkin-flavored things. In fact, I'm down to one can and I think I better stock up before they go completely missing from the stores! I brought these particular pumpkin bars to work last week for my current manager's birthday. Her husband, whom I also work with, told me she likes pumpkin and cheesecake, so I thought this would be a good combination. While these bars were wonderful, the cheesecake flavored didn't come through as much as I would have liked. Even so, these had a great creamy texture and the nutty crust was amazing! These sort of reminded me of this pumpkin dessert and I'm not really sure which I like better....you definitely can't go wrong with either. 1. Preheat oven to 350 degrees. Line an 8 inch square pan with non-stick aluminum foil. 2. In a mixing bowl or food processor, combine flour, brown sugar, and salt. Add butter and cut or pulse until mixture is crumbly. Stir in pecans. 3. Reserve 3/4 cup of the mixture for topping. Press the remainder of the mixture into the pan. 4. Bake for 13-15 minutes. 5. In a large bowl, beat together cream cheese, sugar, pumpkin, cinnamon, allspice, and vanilla. 6. STIR, do not beat, in the eggs. 7. Pour the filling over the baked crust and sprinkle with reserved topping. 8. Bake for an additional 30 minutes, or until top is brown. 9. Cool completely on a wire rack. Lift foil out of pan and cut bars. Serve at room temperature or chilled. My Chobani stash is dwindling, sadly. The other day I ate regular (non-Greek) yogurt and couldn't believe the difference. I really don't think I can go back to regular yogurt, I much prefer the thicker, creamier, tarter taste of Chobani! Thank you Shari for sending me the samples!!!! And the rest of you should definitely just go buy some and try it out--you won't regret it! I've blogged about the quesadillas and the salad from last Saturday's family dinner, but I have yet to mention the star of our meal. This Turkey and Squash Risotto was amazing--reminiscent of Thanksgiving with its flavors but yet completely unique. I owe this recipe discovery to the blog Closet Cooking, which has a ton of creative recipes! However, I really can't take credit for anything other than the discovery of this recipe. Ryan and my mom were the ones who labored over this main dish (and we all know how time-consuming risotto is!). It was well worth the effort (easy for me to say, right ;)) and our family gobbled this up, all taking seconds and even thirds of this dish! If you're out of leftover turkey, have no fear! This would be great with chicken as well, or it could be kept meatless. One thing I'd do next time is add some slivered almonds to the final product. I think a little crunch would have really put this dish over the top! 1. Heat the chicken stock and sage leaves in a saucepan and keep it warm. 2. Melt the butter in a large sauce pan. 3. Add the onions and squash and simmer for 5 minutes. 4. Add the rice and spices and coat with the butter. 5. Add the wine and stir until it has evaporated. 6. Add 1/4 cup of stock at a time, stirring until it has evaporated. The rice is done when it is cooked to al dente. 7. Add the cranberries after 1 cup of stock has been added. 8. Add turkey, parmigiano reggiano, and butter. Stir until the turkey is heated. **note: we doubled the recipe above to serve 9 of us. the only ingredient not doubled was the onion. **DON'T FORGET---CHOBANI GIVEAWAY ENDS TONIGHT! I'll be picking a winner tomorrow morning! My mom made this salad as part of our first course on Thanksgiving. There was a lot of dressing leftover, so she made it again on Saturday as part of our dinner. There were no complaints--I think this salad is a new family favorite! I'll definitely be making this as a nice change of pace from our standard spinach salads. 1. Prepare Lemon Vinaigrette. Transfer 1/4 cup of the vinaigrette dressing to large bowl. Quarter, core, and seed pears. Cut each quarter in thin slices; add to dressing in bowl. Let stand for 15 minutes. 2. Add arugula to pears; toss lightly to coat. Transfer to serving platter. Top with sunflower kernels, Parmesan, and lemon peel. Serve with remaining dressing. Cover and refrigerate remaining vinaigrette up to 1 week. In a bowl combine 1 tablespoon lemon peel, 1/3 cup lemon juice, 1 teaspoon sugar, and 1/2 teaspoon kosher salt. Gradually whisk in 3/4 cup extra virgin olive oil. **Don't forget to enter my giveaway! Only a few more days! Have I mentioned how much I love Chobani greek yogurt? Because I really do! In fact, I managed to eat it in TWO of my meals yesterday. For lunch I had the vanilla flavored with some granola mixed in, and then we used the 2 containers of plain (non-fat & low-fat) in last night's dinner. Unfortunately, we were really rushed putting this dinner together and didn't have time to let the chicken marinate as long as it was supposed to. If I made these again, I would definitely marinate the chicken for several hours to achieve maximum flavor. Even with our super quick marination, these chicken gyros turned out awesome! Ryan and I love to go to this hole-in-the-wall Greek place near our house that serves huge, greasy gyros. However, I always finish that meal with a bit of a stomachache and an inability to eat for the rest of the day. That was not the case with these, which were significantly lighter than your typical gyro. 1. Slice chicken into small pieces. 2. Combine above ingredients and mix well. Add chicken to the marinade and refrigerate for at least 1 hour. 3. Cook chicken on a skillet until cooked through. 4. Add chicken to pitas, along with red onion, tomatoes, and tzatziki sauce. Eat immediately! 1. Squeeze the cucumber in a paper towel to remove excess moisture. 2. Combine above ingredients and mix well. Refrigerate for at least 1 hour to allow flavors to blend. 3. Serve on gyros and store in an airtight container. If you haven't already, leave a comment on this post for a chance to win some free Chobani Greek Yogurt!